An 8-day old male infant, ex-full term, born by normal spontaneous vaginal delivery and discharged home 2 days after birth without identified complications or maternal infections presents with parents to the emergency department due to decreased activity. Starting on day-of-life six, the family noted that feeding appeared to be taking longer and the mother felt her infant was breathing faster. On presentation, the patient was pale, dusky, lethargic and with mottled skin. Temperature 36.3°C (rectal), HR 170, RR 60, BP 62/35, SpO2 70%. Physical examination demonstrated flat fontanelle, coarse breath sounds, regular rate and rhythm without additional heart sounds or murmurs, and hepatomegaly with liver edge 3cm below costal margin. Capillary refill was delayed at 5-6 seconds. Supplemental oxygen was applied without effect. Neonates with undiagnosed congenital heart disease may present to the emergency department with nonspecific symptoms, and may be considerably unstable requiring immediate life-saving interventions. Special thanks to Dr. Kelly Young, MD, MS, FAAP. Director, Pediatric Emergency Medicine Fellowship. Harbor-UCLA Medical Center Department of Emergency Medicine. Association AAOPAAH. Textbook of Neonatal Resuscitation. 2016. Lissauer T, Fanaroff AA, Miall L, Fanaroff J. Neonatology at a Glance. John Wiley & Sons; 2015. Steinhorn RH. Evaluation and Management of the Cyanotic Neonate. Clinical Pediatric Emergency Medicine. 2008;9(3):169-175. doi:10.1016/j.cpem.2008.06.006. MD MR. Chapter 7 – Cardiology. Twenty First Edition. Elsevier Inc.; 2018:156-202. doi:10.1016/B978-0-323-39955-5.00007-7. Gomella T, Cunningham M. Neonatology 7/E. McGraw-Hill Prof Med/Tech; 2013. Yee L. Cardiac emergencies in the first year of life. Emergency Medicine Clinics of NA. 2007;25(4):981–1008–vi. doi:10.1016/j.emc.2007.08.001. Yates MC, Rao PS. 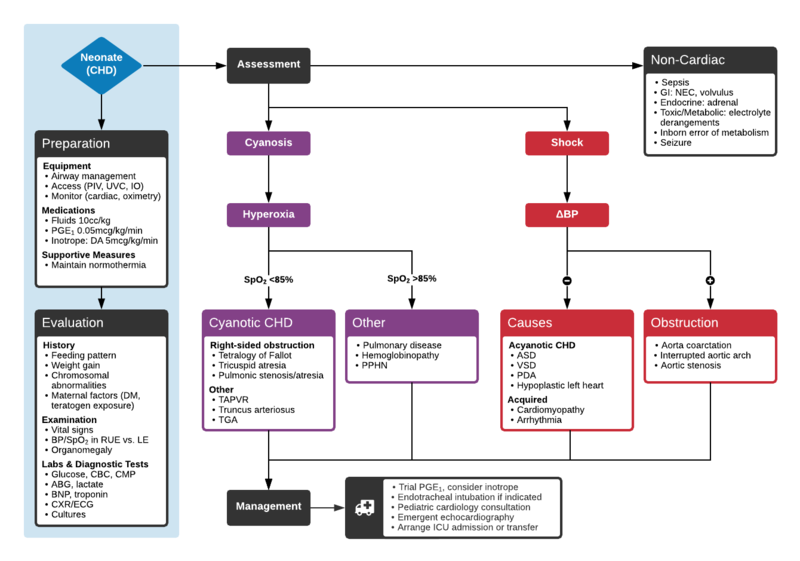 Pediatric cardiac emergencies. Emerg Med. 2013. doi:10.4172/2165-7548.1000164. Silberbach M, Hannon D. Presentation of congenital heart disease in the neonate and young infant. Pediatr Rev. 2007;28(4):123-131. Mastropietro CW, Tourner SP, Sarnaik AP. Emergency presentation of congenital heart disease in children. Pediatric Emergency …. 2008. Brousseau T, Sharieff GQ. Newborn Emergencies: The First 30 Days of Life. Pediatric Clinics of North America. 2006;53(1):69-84. doi:10.1016/j.pcl.2005.09.011.